It started to become a trend. Every day, Adam Spinella, a Washington & Jefferson assistant coach, uploads something he calls the “Daily ATO” to Twitter. It’s filled with whatever Spinella considers the best or most innovative plays in the NBA — frequently after a timeout, or “ATO”. 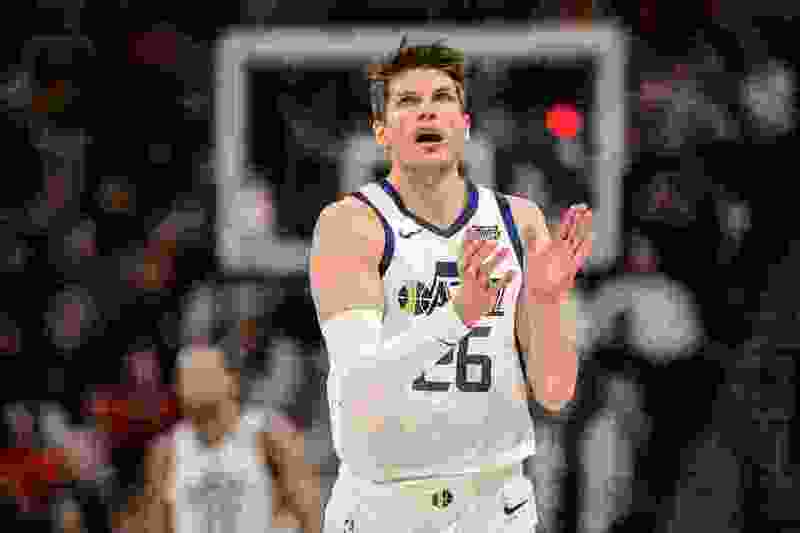 And nearly every day that the Jazz would have a game, the Jazz would be featured in the Daily ATO, with some new play for Quin Snyder’s newest acquisition, sharpshooter Kyle Korver. Maybe more than any player in the NBA, Korver was the constant target of new and creative plays from one of the NBA’s most inventive minds. Or this one at the 21 second mark of the upcoming video, called “Zip to Circle,” where Korver goes all the way around the entire half-court in a circular motion before getting the ball for an open 3-point shot. If running the whole perimeter of the court isn’t enough, how about a double screen along the baseline out of a horns set, like in this play called “Horns Baseline Double” at the 30 second mark? Of course, it makes sense to set screens for a shooter of Korver’s caliber to get open. Two screens only help the situation, if you can dedicate that many to the play without giving the defense a chance to find someone to cover. But usually, Snyder’s drawn-up plays find a way to find Korver in space, too far away for help, too difficult to switch. Korver has a pretty simple explanation for the all of the creativity: he has trust from his coach, and they talk about ways to exploit defenses with his shooting. “When Quin was an assistant coach in Atlanta, he was my assistant who I’d work with every day. And we’d shoot, sometimes, but we would just talk about the game a lot. We used to talk about different angles and scenarios back then. It’s fun to see now that he’s in charge,” Korver said. Assistant coaches, scouts, video personnel, and others who break down plays day after day have taken notice. Spinella even points out a simple action that the Jazz have found that works for Korver: when he takes advantage of an aggressive defense by overrunning a dribble handoff, then cuts back to give himself that extra step he wouldn’t have otherwise. The Houston series could present a problem for Korver. Because the Rockets switch nearly every screen, he might not find the open spaces by running through multiple screens that he might against another team. But he may be able to take advantage of that split-second of transition in a switch, where a screener like Derrick Favors or Rudy Gobert might be able to cut to the rim. That’s where Korver can find one of his teammates for an open dunk. “If you’re the guy that Kyle passes to, you’ve got to feel pretty good about taking that shot,” Snyder said. Snyder is pretty reluctant to talk about the plays he’s created for Korver, and understandably so: he’s created a competitive advantage, the kind of which that can exist for only so long in the hyper-scouted NBA. Of course, that’s not the case: there’s wide agreement that what Snyder creates for Korver is pretty unique. “I like this type of stuff, I like thinking like this, I like thinking differently than what else everyone is doing,” Korver said.